TWO PLAY AREAS IN CAM REGENERATED! 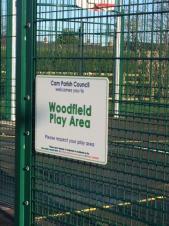 WOODFIELD play park off Hadley Road in Cam and Cam Green play park have now been regenerated and up-graded! The play area at Woodfield was officially opened on Friday 5 April 2019 with an Easter egg hunt and ribbon cutting ceremony. One hundred colourful pegs were hidden around the play park which children had to find and then swapped for an Easter egg. 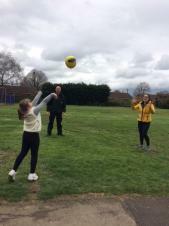 There were also ball skills games. 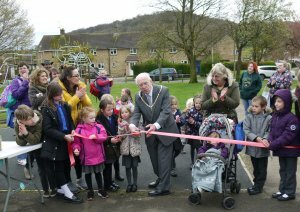 Councillor Whatling said he was delighted with the number of children and their parents who turned out for the official opening. He added: "It was good fun and great to see so many youngsters enjoying the improved facilities." Brian Whatling, Chairman of Cam Parish Council, cuts the ribbon officially opening Woodfield play park. 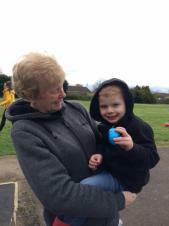 Sally Savery and Freddy Savery, aged 2, with his Easter egg. 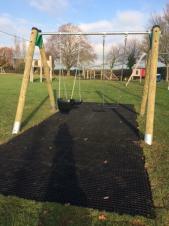 At Woodfield play area the toddler area has been completely overhauled with new swings, springers, a see-saw and a multi-play unit with a slide and climbing frame. The area has been fenced to prevent young children from running into the road. 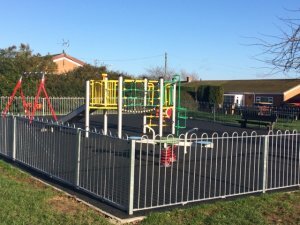 A new MUGA has been created with markings for basketball, netball and football as well as hopscotch and a colourful number snake painted onto the surface of the path running alongside. The football zone has been improved with new turf and a "D" shaped wetpour kickabout area installed. 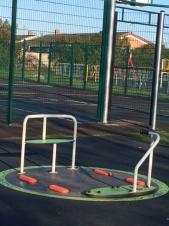 Two new flat swings and an all-inclusive ground-flush roundabout have also been added. 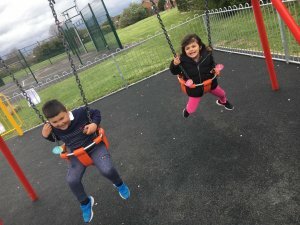 At Cam Green play park a new tango swing unit with a toddler seat at one side and a flat seat opposite for a parent or an older child to use, as well as an extra traditional swing have been installed. 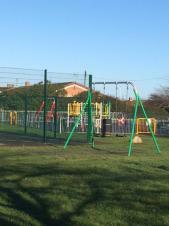 A new bench has also been added for parents to sit and watch their children having fun on the new equipment. 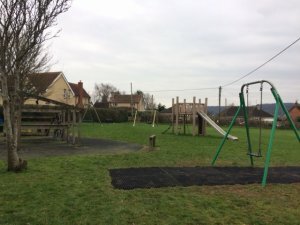 The ambitious projects followed public consultations held by Cam Parish Council where local people had their say on what they wanted to see at the play parks. The original plans were amended to take on board demands made at these consultations. We wanted to get the plans completely right – and we hope that we have!